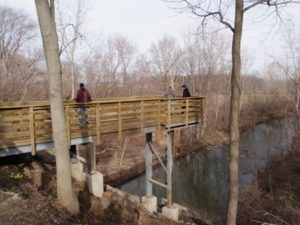 Norwalk Kiwanis Overlook – Firelands Rails to Trails, Inc.
Feel the wind in your fur! Soar where eagles dare! Thanks to the Norwalk Kiwanis, trail users may walk among the treetops and get a bird’s eye view of the magnificent 1871 stone double arch bridge, located at the East Branch of the Huron River, one-half mile west of North West Street. This amazing structure sits forty feet above the river and offers great views in any season. Check out the view from our Huron River overlook. Completed by the Norwalk Kiwanis in 2011, this overlook is located at our 1871 Double Arch Bridge over the East Branch of the Huron River, 1/2 mile west of our N. West St trailhead in Norwalk, and sits 40 ft above the riverbed.